How do you add fire to a shot that was not originally filmed with it? What things should you know? How do you add convincing smoke to a shot? Fire, flames, or any other type of illuminous object (fireworks, glowsticks, sparks) all cast light onto their surroundings. In darker environments, this is apparent. What do you do in lighter environments? 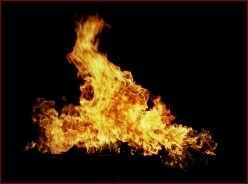 Some things to remember is that fire gives off heat, and in turn, heat distorts the atmosphere. In manipulating composites containing fire and flames, keep in mind heat distortion will affect what's behind the edges of the flames. As well, it does illuminate objects during the day! You will have to experiment to accurately reflect what a fire will cast light onto in your shot. Most composites with flames and fire can easily be created by using a lumakeyed matte of the image. These are usually sufficient, but may need some final tweaking depending on the environment at hand. Smoke is another matter. It doesn't give off light, it obscures it. How do we lumakey smoke so that it can fit into a scene? I've seen many beginning compositors forego using the actual smoke, and just use the lumakey matte of it instead! Smoke is not always opaque, it does drift through the atmosphere, often catching ambient lighting from its environment as well. You'll noticed on the above images that the smoke on the left has some semblance of dimensionality. It has shadows falling upon itself, and does not look flat. 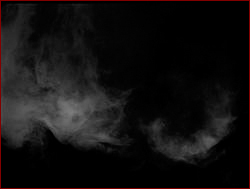 The image on the right is a monochromed or alpha image of the same smoke image. Notice that there is no depth. Everything is grayscale, and there is no dimensionality. As well, the grain structure of the image has changed. No longer will you have colored, accurate film grain, it will have changed to being monochromatic and grayscale. This page contains a single entry by Aruna published on March 4, 2005 8:55 AM. Projection - Part 1 was the previous entry in this blog. Tippett Studio is the next entry in this blog.